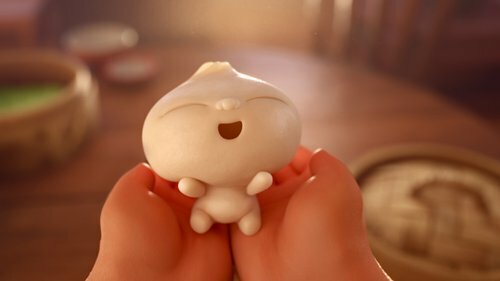 After Disney Pixar released its short film Bao on YouTube on December 18, it managed to rack up more than 2 million views in just 48 hours. The film, which originally showed in theaters over the summer before Pixar's Incredibles 2, tells a story of an empty nest Chinese-Canadian mom who raises one of her dumplings, the titular Bao, after it springs to life one day. While most of the film is heartwarming, it takes a shocking turn when the now grown-up dumpling gets in an argument with the mother about wanting to move out on his own and she, in a fit of panic, suddenly grabs him and swallows him whole. This short film sparked heated debate among viewers, especially in China. Some were moved to tears by the depiction of the mom's immense love and considerate care, while others criticized the mom for being overprotective of Bao and trying to control his life. This story, by Chinese-Canadian director Domee Shi, reveals the painful conundrum of parenthood. Parents desire to protect their children, while growing children eventually want to head out and face the world on their own and, in some cases, poor communication leads to resentment on both sides. For Chinese families, in which members rarely express their love for each other in words, figuring out how to talk about one's feelings can be particularly difficult, which is one of the reasons the film struck such a chord among Chinese audiences. Other recent works from Chinese filmmakers have also tackled issues surrounding parenting. On December 7, Chinese movie Einstein and Einstein, which was sharply critical of traditional Chinese methods of parenting, hit theaters in China. The film tells the story of a 13-year-old girl struggling with an absentee father and grandparents who only seem to care about turning her into an obedient adult even if it means getting rid of everything that makes her unique. According to the film's director Cao Baoping, he wanted to reveal the oppressive hierarchy that exists in the family structure of the traditional Chinese culture. "Order is the structure in a family and society. Children must obey their elders. Elders are always right no matter what they say. This kind of order is not established on treating each other equally as individuals," the director said in an interview while promoting the film. "Children are pushed to do things they may not want to by their parents in the name of love. I think parents don't understand or sympathize with their children," the film's lead actress Zhang Xueying noted in one interview with media. While some Chinese fathers may come across as dictators at home, some Chinese mothers may end up being treated by their children more like the hired help than the person who gave them life. In the Chinese reality show, My Little One, Chinese actor Zhu Yuchen's mother shocked Chinese netizens with some of her revelations about her relationship with her son. "I have dedicated my entire life to taking care of my boy," she said in one episode. She handles household chores as efficiently as two maids. To this day she still makes boiled pear tea for her son at 4 am every day. "I feel guilty if my boy cooks for himself," the mom said. Most Chinese netizens didn't view the mother's behavior as some great sacrifice. On the contrary, they felt that her putting all her energy and focus entirely on her son and not having her own life was a terrifying move. When it came to Zhu's mom's standards for a daughter-in-law, netizens joked that it was like she was either trying to "find a maid" or "a new mom to carry on taking good care of her boy." After the show aired, netizens began referring to Zhu as a mabaonan (lit: mother's baby man), a label for men who rely heavily on their mothers and whose mental age does not correspond to their actual age. The reaction of viewers and the rise in the amount of media examining traditional parenting roles indicates that things today are changing. This can also be seen reflected in the attitudes of young mothers' today. Tang Shulan is a 20-something mother of a 2-year-old daughter. Talking to the Global Times, she noted that "parents tend to devote too much to their children and neglect the importance of developing children's ability to be independent." As to whether she was willing to follow the example of Zhu's mom and dedicate all her time and energy to her child, Tang was of the mind that this would actually be detrimental to her relationship with her daughter. "I believe that mothers should have and enjoy their own lives. This can give both the mother and the child space to develop as people," she noted. Bai Xue, a 29-year-old administrator at a university in Beijing and mother of a 2-year-old, told the Global Times that today's young and educated parents are no longer relying solely on past personal experience or tradition to raise their children and are instead turning to knowledge gained from books written by experts in the field of parenting. This also shows that they are more open to the idea of growing along with their children by admitting they don't know everything.